Already? How did that happen? Austin reminds me that more walks and squirrel chasing are in order. He’s on a short leash for a while since he bolted away from the dog group area. Thing is, he can’t read the sign that says Leaving Off Leash Dog Area. So he kept going to the rocks where the Squirrel Sirens beckoned him towards the roiling surf. I did finally catch him but not before he led me a merry dingo chase. The rat. Three days in a row of painting topsides. For you non boaties that is the vertical hull above the waterline. After the endless sanding came a primer rolled on, then a 50/50 primer/topcoat mix rolled and tipped, and today a topcoat rolled and tipped. Tipped is when you lay down the bubbles with a light whisking of a dry brush. Maddening to see the bugs fly in and get stuck. Or the dust from other projects or the road get kicked in. My neighbor touched the wet paint and left fingerprints and I barked at him and he said, “It’s only a boat, it’s not furniture.” It’s not furniture, it’s just my whole HOUSE. It takes an hour to paint each side and a half hour to clean up and then I wait for the next day to paint so now seems like a good time to blog and draw and plan. Saturday Cree (yard owner) claims the boot stripe will go on. The mid line and the eyes should go back on before Tuesday when Gwynn is hopefully going to come up and do the lettering. She does great lettering. Then there’s more sanding underneath and painting the bottom. I decided to wait on the outboard project. I like the idea of the extension (to make the shaft longer) and will figure out how to finagle that once I’m safely in a slip. Oh, I just went to talk to the harbor master at Berkeley today. 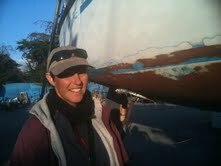 She agreed to let me liveaboard for a month while I take care of the outboard and some canvas jobs that have cropped up. To be in the water again will be bliss. This on the hard livin’ is givin’ me a headache. The world should be in motion with the ocean, dang it. Or maybe it’s paint fumes giving me the headache. At any rate, this is the true rhythm of liveaboardism. You make a plan, it is thwarted. You make plan B and hope it sticks. Optimism is key and living in the moment is unavoidable. Maybe that’s why I like it. You deal with what is in front of you and there’s no way to pretend you are more in control than you are – as we do on land. If I can someday convey that philosophy or state of being in a show me don’t tell me way, I will have lived a worthy life. This entry was posted on Thursday, May 13th, 2010 at 11:19 pm and is filed under Boat Improvements and Cruising Life. You can feed this entry. You can leave a response, or trackback from your own site. Ginger has the same problem – she can’t read (or chooses not to understand, can’t prove it either way), and the varmint force is strong and irresistible in her. She hasn’t learned that the resident cats are not only larger than her, but could easily eat her if it came down to it. Silly Ginger!